Maia & The Big Sky experiment with East Africa coastal polyrhythms, mixing these with funk, reggae, jazz and folk, creating a familiarity and warmth that transcends continents. Maia von Lekows lyrics in both English and Kiswahili touch on power, love, politics and the strength of women. Maia has shared stages with artists such as Keziah Jones (Nigeria), James Blunt (UK), Habib Koite (Mali), Thandiswa & Mafikizolo (South Africa). Her hypnotic velvet vocals and highly engaging live act has travelled all over the world, highlighting the diversity of Kenyan music. Recordings include 2008’s self-titled EP featuring Oyster which appeared on Warner Poland’s Ladies’ Jazz Album Vol 6, and Uko Wapi which earned her two African Academy Awards for best sound track. Her debut album Drift, released in 2012 featured the highly-acclaimed single Jellyfish. The new albums entitled Maia & The Big Sky (2017) features the single ‘Lola’ includes a stop-motion music video and has received radio airplay across the world as did the video for the single ‘Pawa’ featuring Blinky Bill. Maia has toured in USA, UK, Australia and East Africa. Festival performances included Africa Utopia (UK), HIFA (Zimbabwe), Sauti za Busara (Zanzibar), Blankets & Wine (Kenya), Visa for Music (Morocco), Woodford Folk Festival and Perth International Arts Festival (Australia). Js Fresh Kitchen accepts reservations so please make a reservation for a table should you know you will be coming for dinner. The number for reservations is 0707612585. 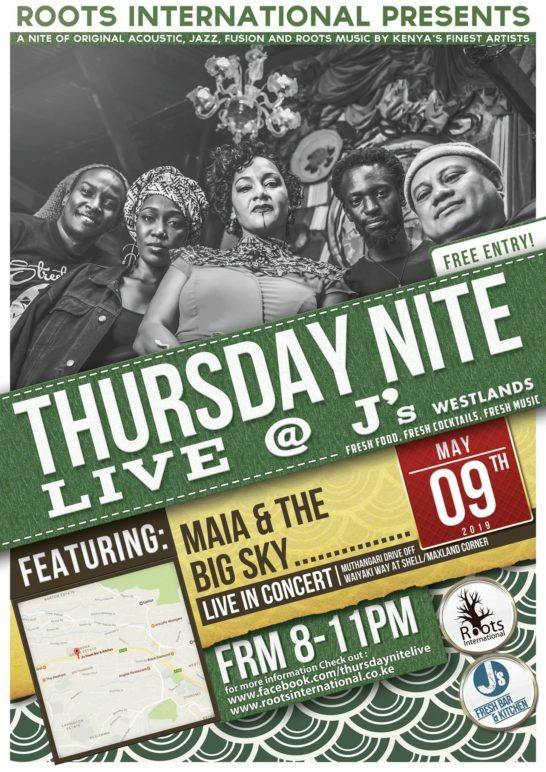 Js Westlands is a 23 years and older venue. The show starts promptly at 8pm so tables are held till 8pm after which they are opened to other customers.